A member of the gourd family, this versatile vegetable from Mexico is roughly pear-sized in shape and light to dark apple green in colour. Chayote Squash has a smooth skin with slight ridges running from stem to end. 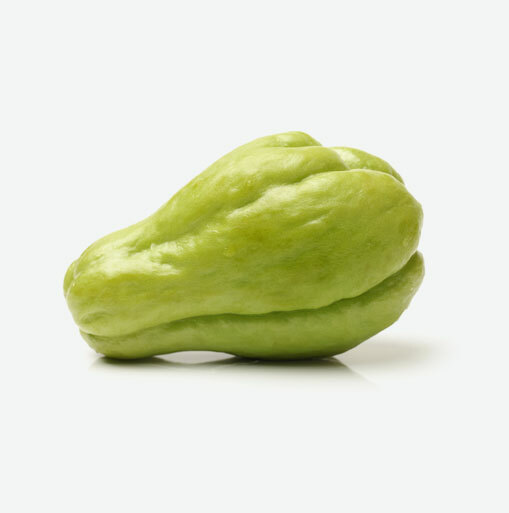 The average chayote weighs about 1/4 pound and measures approximately 3-4 inches in length. It is similar to summer squash, but this vegetable requires a longer cooking time because of its firmer texture. chayote squash is also known as the “vegetable pear”. Chayote Squash is very low in Saturated Fat, Cholesterol and Sodium. It’s also a good source of Niacin, Vitamin B6, Pantothenic Acid, Magnesium and Potassium, and an excellent source of Dietary Fiber, Vitamin C, Vitamin K, Folate, Zinc, Copper and Manganese. These vitamins and minerals are important to enhancing overall good health. Choose squash that are heavy for their size and have a hard, green skin free of blemishes or moldy spots. Tender skin indicates immaturity or poor quality. chayote Squash stays freshest lightly wrapped and refrigerated for up to one week. Do not peel this squash until you are ready to use it. Look for chayote that is firm, unblemished and light to medium-green in colour. The skin may be either smooth or rough. Avoid squash that is soft or blemished. Chayote squash can be steamed, baked, stuffed or fried. Incorporate this vegetable into soups, stews and use as side dishes. Chayote makes a wonderful addition stir-fries and may be sliced or chopped and used raw like a cucumber. The seeds are edible and can be roasted like pumpkin seeds.